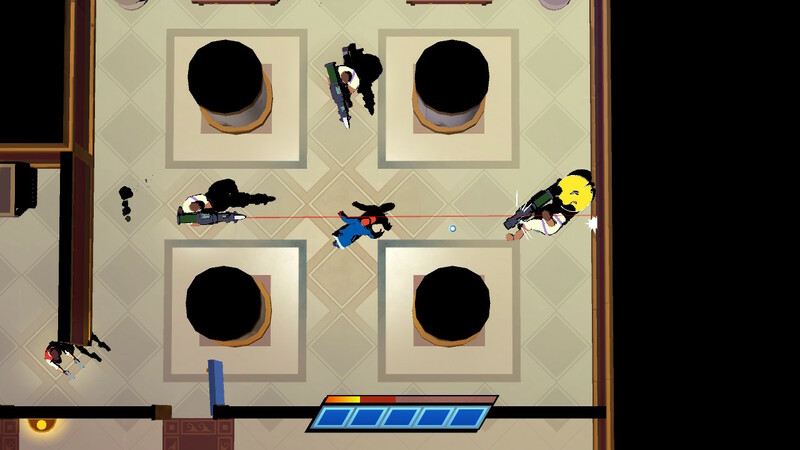 In recent events, It’s been pointed out to me that Mr. Shifty on the Nintendo Switch has received some rather negative flack. Whether it be about “poor customer service” (anyone who’s worked in retail should see that as legitimate customer service) or low review scores due to the concerns raised in said service, I’m here to give my two cents. My review isn’t bought and paid for, I just had an honestly good time. Why should you pick up this title on the Nintendo Switch? Well, let me break it down for you. Was it a missed opportunity to not have this be a stealth game? Maybe, but this is an action beat’m up and one that delivered well. The first time I came across Mr. Shifty was at PAX within the TinyBuild booth area. They always have some cool games in there and it’s always worth checking out. This time, I found a small game on one PC just chilling and thought it looked interesting. I mean come on, a game where you go teleporting around and punching bad guys in the face? This game was almost made specifically for me! (One of the earlier game concepts I was working on had the main character who only used his fists so I was basically all-in at first glance.) So I grabbed the “obligatory” Xbox controller (why does everybody use these things) and started to play. Well, for the life of me, I was interested, but I probably looked like a fool with the sheer amount of bad I was doing. I probably looked like a WoW Warlock rubbing my face on the keyboard (controller) only without the “performing well” bit. While I wouldn’t wish this high of a death count on anyone, it was a lot of fun to figure out where to go and when to attack. It’s almost like a puzzle game… with punching. I was a little disheartened by my escapades, but not deterred. I figured I’d get another shot at it and that day came. 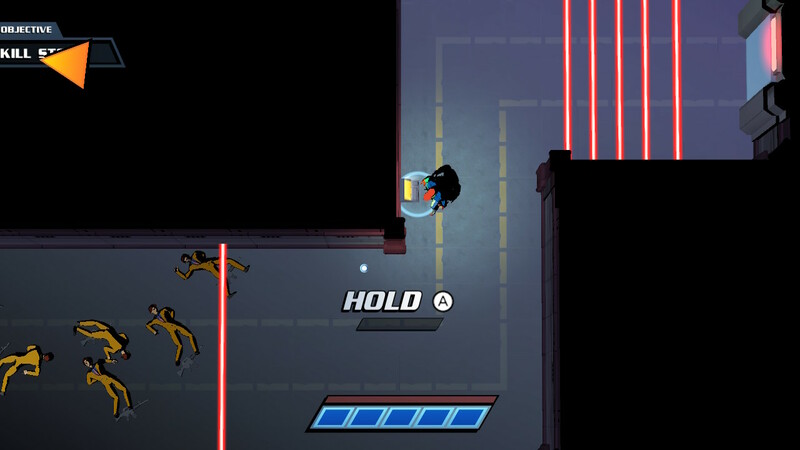 Mr. Shifty is really about being a teleporting thief breaking into a super secure building to steal something and ends up needing to escape by force. Your main weapon is your fists and your ability to shift through walls to come up behind and knock some people’s heads. A solid premise to be sure, and definitely not lacking in fun! I’ve heard that there are only 18 levels, so that means I’m almost done. 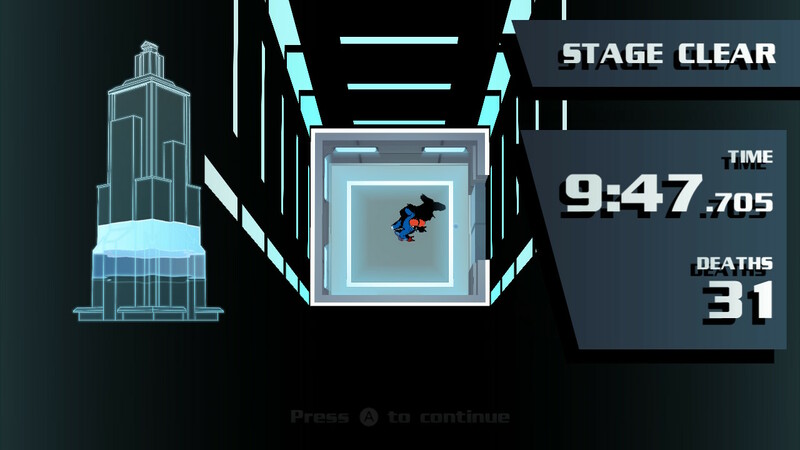 Theoretically, you could probably complete this game quickly, but it’s taking me some time. There have been times where I wish the death-counter wasn’t there at the end of the stage mocking me, but that’s just how things are. At first I was worried about the variety of bad guys that would be in the game, but that was put to rest because there varying types that all want to see you dead. 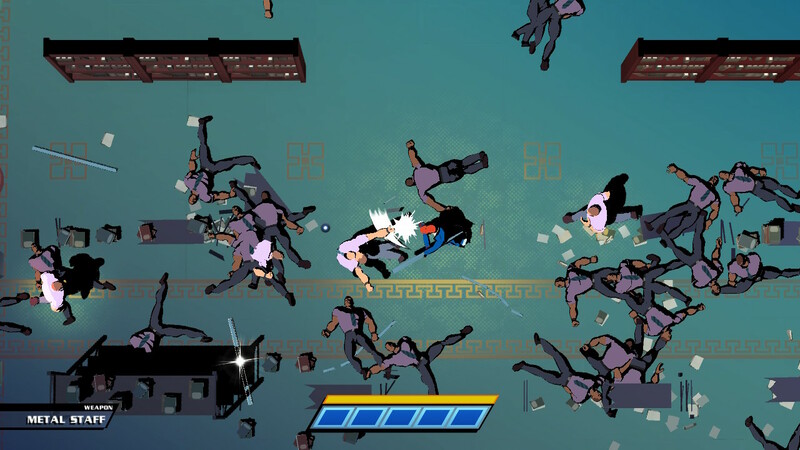 Almost everything from other fisticuffs brawlers to shotgun wielding accountants will try to stop you from getting to your goal. You’ll be teleoporting in and out of rooms to confuse enemies and come from behind and punch them. In the later levels I learned that they are susceptible to friendly fire. 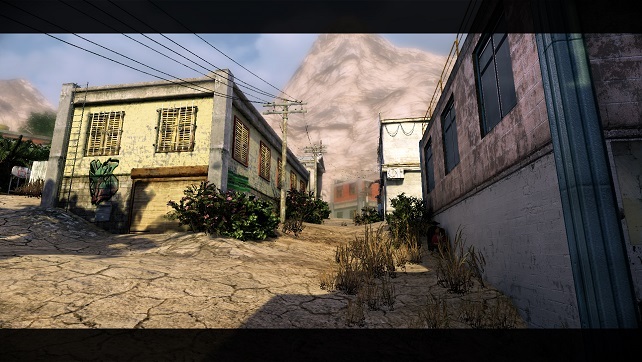 I would teleport around taunting guys with rocket launchers to then have them off a bunch of their friends. This is satisfying when it works, but it doesn’t always work well for me. I’ve caught a few rockets with my face and teleported into bullets while escaping projectiles. Situational awareness is a good skill to have while playing. When Mr. Shifty throws his mighty shield, all those who chose to appose his shield must yield! 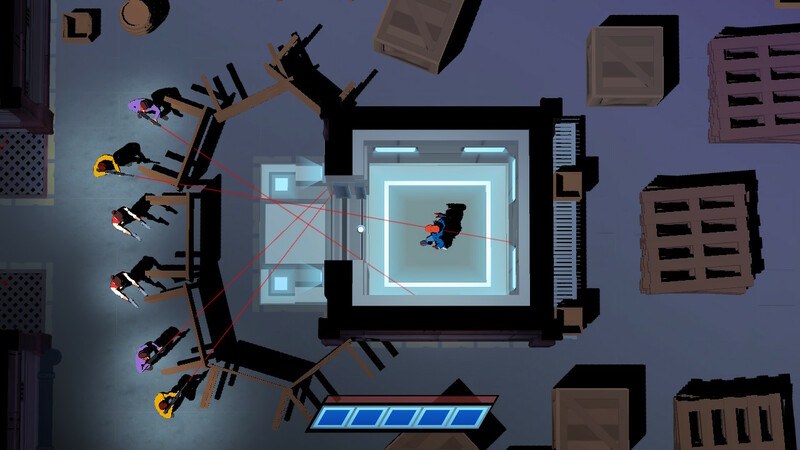 As for that elephant in the room, I didn’t really have many issues with Mr. Shifty and frame drops. In the later levels, there was this drastic drop when I woke it up from sleep mode to play more. It weirded me out because the rest of my gameplay hadn’t been interrupted up to this point. I reset it and the problem was solved. That also only tends to happen when I wake it up though. So if you have an issue, just restart the game. It’s not like you’ve never had to do that for your PC. The only real-time the game slowed was when my combat meter was filled and someone shot at me and the game slowed down on purpose to give me a chance to escape death. I feel for anyone having issues, but the game ran great for me and not once in my Switch play-through did I wish I had the Steam version. Mr. Shifty does science with lasers and the men in yellow are floored by his skills. This was a tough score to give. It’s not that I don’t honestly think it deserves the rank, but I’ve read so much negativity that it started to leak into my opinion of the game. It even started to feel repetitive. Looking back though, I have always wanted to play a game where punching baddies in the face was the main way to dispatch them and I really had a lot of fun teleporting around and sock’n people with Mr. Shifty. I’m not sure what changed since PAX, but while I was still losing a lot and it wasn’t very frustrating. For $15, I can honestly say that people who are looking for a good beat’m up on the Switch need to look no further than Mr. Shifty.